But that’s not the amazing thing about this 31-year-old Wallingford resident. 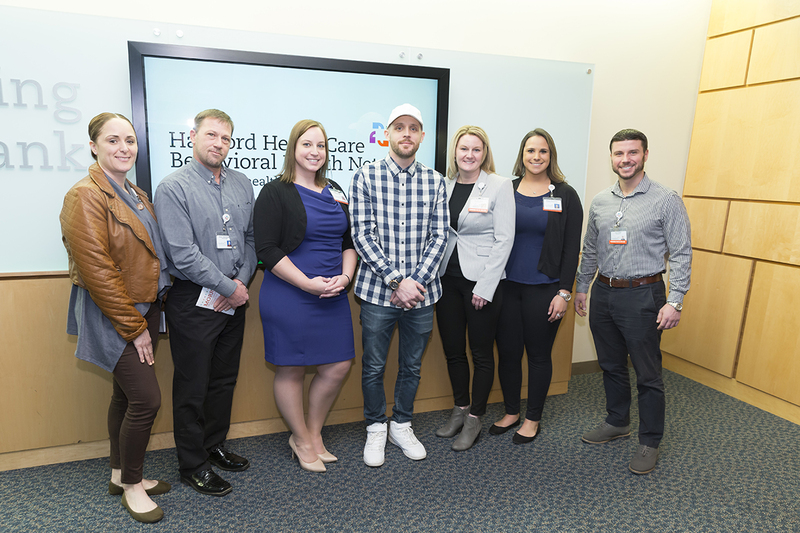 The real story is his comeback from the depths of opioid addiction with the help of Rushford and the Hartford HealthCare Behavioral Health Network. Conklin spoke Wednesday, Feb. 20, at MidState Medical Center where health and town officials announced the Meriden Opioid Referral for Recovery (MORR) program. Fueled by a $2-million federal grant, it is a partnership between Rushford, MidState Medical Center, the Hartford HealthCare (HHC) Behavioral Health Network (BHN) and the City of Meriden fire, police and ambulance. Conklin was introduced to painkillers in his early 20s, first using pills like Percocet recreationally and then daily. He eventually progressed to heroin, ending up jobless and stealing to support his habit. By the age of 25, he was living in an apartment without electricity in Middletown, running an extension cord to his neighbor’s to power a small space heater. Later, he found himself living in his car in Florida. He remembers thinking, “This can’t be it; I have to be capable of more than this.” Finally, he got serious about making changes and, with the help of Rushford, has been sober since June 19, 2016. He has his own business, KC Makes Music, which is beginning to pay dividends. Most importantly, he is enjoying life again. BHN Physician-in-Chief John Santopietro said the opioid crisis continues to claim 70,000 lives annually, almost twice the toll of breast cancer, and MORR is a way for the community to work together to solve the problem. James O’Dea, PhD, MBA, BHN vice president, praised Rushford staffers Jessica Matyka and Krystle Blake for work on MORR and community outreach, then told a story about an overdose patient at the Backus Hospital Emergency Department about a decade ago. He and others were able to save the patient’s life, but unable to coax him into long-term recovery. The MORR grant offers tools. Police Chief Jeff Cosette said the opioid epidemic is ravaging Meriden, and arming police with training and Narcan will help them understand the minds of those with mental health and substance abuse issues. The end result, he said, will be more people getting treated instead of locked up for petty crimes. “This is a win-win for the community,” he said. Fire Chief Ken Morgan said the grant offers a new path for first responders. “This will take our band aid fix in the field and lead to a global approach to getting them better and reducing the epidemic in this city,” Morgan said. Dr. J. Craig Allen,Medical Director of Rushford and Vice President of Addiction Services for the Hartford HealthCare BHN, said resources, training and partnerships – with medication-assisted treatment and recovery coaches in emergency departments and outpatient locations – is an evidence-based approach to tackling such health issues. MORR expands the programs Rushford and Hartford HealthCare already offer in the area, including the presence of recovery coaches in the emergency department at MidState Medical Center. Rushford has also hired a team of skilled professionals to work with individuals referred through MORR. These include peer support specialists who play an integral part in supporting people in recovery, and their families. The city will use MORR grant monies to purchase up to 400 doses of Narcan in each of the grant’s four years, saving excess for future use. In addition, Meriden will collaborate with Rushford and Hunter’s Ambulance on educational programs outlining the dangers of opioids for local healthcare providers while providing them with materials on treatment and recovery for patients and families.